We are specialized in manufacturing Fire retardant coatings.Product widely being used as fire retardant for buildings, furniture, electrical appliances, electrical lines and near flammable area to avoid fire hazards.We have separate coatings for walls, wood, cable and steel. For steel we have different coatings for interior atmosphere and exterior atmosphere. The fire ratings of the coating depend on the thickness of the coating and are directly proportional to the thickness. Fire rating means the surface will be protected for that much time. These ratings are 30 minutes, 60 minutes, and 120 minutes or half hour, one hour and two hours. The purpose is for getting the time till help arrives to protect property and lives. These coatings require fire rated primer followed by fire retardant intermediate coating and then finally the topcoat on the top. Primer is applied in single coat and is different for different surfaces. Intermediate coating thickness is different for different ratings and different surfaces. The topcoat requires two coats. The topcoat is necessary for protection of intermediate coat and also for providing aesthetic value to the surface. We provide the test certificate for each batch we produce and the tests are done as per ASTM test procedures. 1) UGAMCOAT FR SYSTEM isTested andCertified for 2-hour fire rating by Government of India's National Test House Mumbai. 3) UGAMCOAT 290908 FIRE RETARDANT PAINT for Electrical Cables isTested andCertified for Circuit Integrity for 4 hours from Central Power Research Institute as per IEC 60331 part 11 and 21 as well as IEC 60332 part 1 and 2. 6) UGAMCOAT FR SYSTEMis Tested & Certified for VOC CONTENT ANALYSIS fromSpectro Analytical Labs Limited. Approvals Central Power Research Institute as per IEC 60331 part 11 and 21 as well as IEC 60332 part 1 and 2. UGAMCOAT 290908 FIRE RETARDANT PAINT for Electrical Cables is Tested and Certified for Circuit Integrity for 4 hours from Central Power Research Institute as per IEC 60331 part 11 and 21 as well as IEC 60332 part 1 and 2. UGAMCOAT 290908 is tested and certified for 2-hour rating by Government of India's National Test House Mumbai. Water base, in tumescent, fire retardant, flexible and thin coating for cables and cable trays. Thin film coating approximately 800 microns provides reliable fire protection without causing premature ageing or overheating of cables. Halogen and asbestos free coating. Rating of electrical cables is not reduced. Escape routes and power supply can be used for longer time. Flame spread, and insulation damages are delayed in case of prolonged exposure to fire. Minimizes smoke generation thereby permitting use in enclosed areas. Burning drips and burning cable fragment drops are minimized to greater extent. 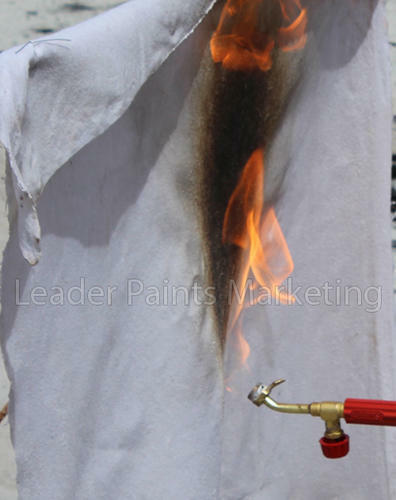 Coated surfaces will not catch fire or ignite or spread fire. Meets many stringent international fire standards. Best coating with the highest fire protection amongst the coatings of this class. Chemically converts nitrogen oxide and chlorine produced during burning of cables to foam and charring material thereby reducing the possibility of toxic gasses emission. It forms foam when temperature reaches 200 degrees Celsius. This foam is heat and fire resistant and almost non-conductive. This keeps the surface away from heat and hence does not allow the surface to receive or conduct the heat in other areas. Also, since this forms foam and a charred layer, it does not allow oxygen to reach to the surface over which it is applied. Hence it protects the surface from catching fire. Areas should be cleaned, dried and made free from oil and dust. Surface temperature should be greater than 20 degrees C Stir the can properly. Observe the viscosity for brushing / airless spraying. Add soft water if required. Apply minimum two coats or as per requirement to achieve 800 microns dry film thickness. If smooth and decorative finish is required apply UGAM EPOXY TOP COAT (suitable for intumescent coating). No primer is required for this system if to be applied over cables. But if application is over metallic surfaces, UGAM ZINC RICH PRIMER should be applied. Feel free to get in touch for further queries, if any. 1) UGAMCOAT 06022007 System is tested and certified for 2-hour rating by Government of India's National Test House Mumbai. 4) Our UGAMCOAT 06022007 FR SYSTEM is Tested & Certified for VOC CONTENT ANALYSIS from Spectro Analytical Labs Limited. It is specially prepared for getting fire retardant properties in wood. Wood is flammable itself by nature. 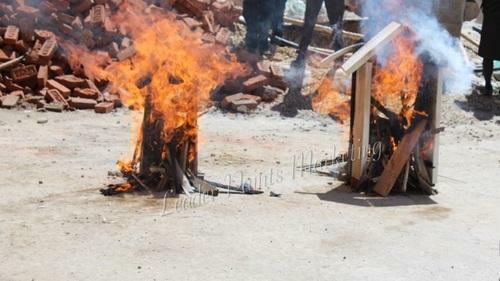 When there is fire in the vicinity and the temperature reaches 400 degrees C, wood gets self ignited. And the reaction of fire starts spreading. To prevent such heat transfer and to block the oxygen from reaching to the surface these types of intumescent coatings are used. These are useful on all types of wood but since these are opaque, the wood grains are not visible after coating these coatings on wood. It forms foam when temperature reaches 250 degrees Celsius. This foam is heat and fire resistant and almost non-conductive. During the foam forming reaction, some inert gasses are released. These gasses keep Oxygen away from wood. The foam thus formed keeps the surface away from heat and hence does not allow the surface to receive or conduct the heat in other areas. Also, since this forms foam and a charred layer, it does not allow oxygen to reach to the surface over which it is applied. Hence it protects the surface from catching fire. UGAMCOAT 06022007 requires its UGAM FIRE RETARDANT PRIMER to be applied first, followed by application of UGAMCOAT 06022007 to the specified thickness with respect to rating required and then finally two coats of UGAM F R TOPCOAT WOOD. First clean the surface with emery papers. In case old paint or primer which is not fire rated is applied to the wood, remove it with paint remover or mechanically. Then apply single coat of UGAM F R PRIMER for wood. The primer can be thinned down with pure clean soft water. Primer can be applied with brush or spray. Then after minimum four hours interval apply first coat of UGAMCOAT 06022007 with brush, roller or airless spray to the surface. Allow four hours for drying. Then apply second coat of UGAMCOAT 06022007 to the surface and again allow four hours for drying. Likewise go on applying the coats of UGAMCOAT06022007 to the surface till you achieve dry film thickness of 700 microns for one-hour rating OR 1500 microns for two hours rating. After application of final coat of UGAMCOAT06022007 to the surface allow 24 hours curing. Then apply first coat of UGAM F R TOPCOAT WOOD in desired color shade over UGAMCOAT0 6022007 for protecting fire retardant coating from weather. Allow it to cure for six hours and apply second coat of UGAM F R TOPCOAT WOOD. This can be applied with roller, brush or spray. The surface will now be ready after 12 hours for regular use. This coating is warranted for five years or first incidence of fire from the date of application. In case surface is exposed to fire, the coating should be re-applied to the surface. UGAMCOAT 220908 FLAME RETARDANT COATING FOR WOOD, FABRIC. UGAMCOAT 220908 is tested and certified for 2-hour rating by Government of India's National Test House Mumbai. First it resists the fire with the help of special fire-resistant chemicals. Then it releases water molecules after prolonged exposure to fire. Simultaneously it releases small amount of gasses to block the Oxygen in surrounding area. It also forms charred layer to prevent the area from receiving oxygen and stopping the spread of flame. Hence due to lack of oxygen, presence of water and prevention of spread of flame, the fire does not spread and gets retarded. Wooden grains should be first filled with water base fillers of the same colour as wood or required colour. After drying the surface should be sanded down lightly. Apply UGAMCOAT 220908 by brush or spray. In case over coating is required, should be applied without sanding the surface. Now the wooden surface is ready for prevention of fire. For Fabrics, soak the fabric in the chemical and let it dry. Iron press the fabric and is ready as fire resistant fabric. Once exposed to fire, the coating should be applied again. You can Email us on sales.ugamchem@gmail.com or contact us on +91-7219872619. UGAMCOAT 141098 EP System is tested and certified for 2 hour rating by Government of India's National Test House Mumbai. UGAMCOAT 141098 EP is designed for use on steel surfaces exposed to weathering and for tanks of petroleum products. Exposed fire exits, external staircases, columns, beams etc should be coated with this coating. It releases water molecules once exposed to fire. It also forms charred layer to prevent the area from receiving oxygen and stopping the spread of flame. It also releases some gasses, which prevent the oxygen from reaching nearest surrounding. Finally when the temperature crosses 250 degrees Celsius, it forms foam and protects the structural steel from getting heat for conduction and convection. 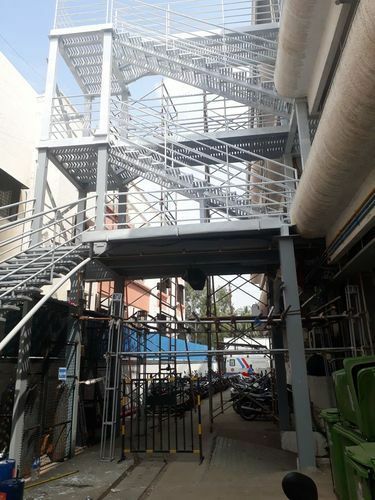 Due to the heat blockage, the steel does not melt and also does not pass heat to other areas. This also blocks Oxygen to surrounding area. Hence due to lack of oxygen, presence of water and prevention of spread of flame, the fire does not spread and gets retarded. 1) The metal surface will be sanded down to remove loose dirt, dust, loose primer coated or oil from the surface. 2) Then single coat of UGAM F R PRIMER EP for intumescent coatings will be applied to the surface after mixing base with hardener in 4:1 ratio and with roller. 3) After curing of minimum eight hours, first coat of UGAMCOAT 141098 EP will be applied with the help of roller again after mixing of base with hardener in 4:1 proportion. 4) After curing of minimum eight hours, second coat of UGAMCOAT 141098 EP will be applied with the help of roller again after mixing of base with hardener in 4:1 proportion. 5) After curing of minimum eight hours, third coat of UGAMCOAT 141098 EP will be applied with the help of roller again after mixing of base with hardener in 4:1 proportion. 6) After curing of minimum eight hours, fourth coat of UGAMCOAT 141098 EP will be applied with the help of roller again after mixing of base with hardener in 4:1 proportion. 7) After curing of minimum eight hours, fifth coat of UGAMCOAT 141098 EP will be applied with the help of roller again after mixing of base with hardener in 4:1 proportion. 8) After curing of minimum eight hours, sixth coat of UGAMCOAT 141098 EP will be applied with the help of roller again after mixing of base with hardener in 4:1 proportion. 9) After curing of 12 hours, the DFT will be checked and further coats requirement will be decided if require. 10) After minimum 12 hours of application of last coat as above, first coat of UGAM P U F R topcoat will be applied with help of roller after mixing base with hardener in 4:1 proportion. 11) Finally after minimum 8 hours of application, second coat of UGAM P U F R topcoat will be applied with help of roller after mixing base with hardener in 4:1 proportion. 12) The surface will be ready to take in use after 24 hours of application of final coat. 13) The final dry film thickness will be around 1800 microns for 2 hours fire rating. 1. BHARAT FORGE LTD. – LPG Bullets, condensers and pipelines. 2. BARCLAYS TECHNOLOGY CENTER – Documents cupboards. 3. TUBE PRODUCTS OF INDIA Chennai – LPG Bullets and pipelines. 4. SUNDARAM FASTENERS Chennai- LPG Bullets and pipelines. 5. I A U India LTD- Server room cabinets and racks. 6. ONGC- Neelam Platform diesel tank and pipelines. 1) UGAMCOAT 07022007 FIRE RETARDANT PAINT is Tested and Certified as per British Standards BS 476 by EXOVA WARRINGTONFIRE LABS UK. 3) UGAMCOAT 07022007 System is tested and certified for 2-hour rating by Government of India's National Test House Mumbai. 5) UGAMCOAT 07022007 FR SYSTEM is Tested & Certified for VOC CONTENT ANALYSIS from Spectro Analytical Labs Limited. It is specially prepared for getting fire retardant properties in walls. Generally, cement walls are not flammable but when there is fire on one side, the temperature is conducted or radiated though the walls and when the temperature rises above 200-degree C on other side, the products like paper gets self-ignited. To prevent such heat transfer, these types of intumescent coatings are used. These are useful on cement, concrete, gypsum, fibre board partitions etc. Suitable on walls, plastered surface, asbestos, cement sheets, textured finishes. This is water base coating hence is eco-friendly. First clean the surface with emery papers. In case old paint or primer which is not fire rated is applied to the wood, remove it with paint remover or mechanically. 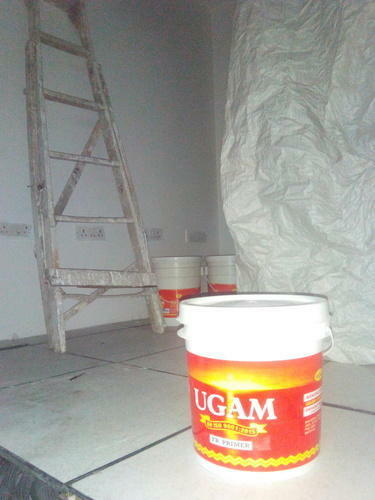 Then apply single coat of UGAM F R PRIMER for wall, gypsum. The primer can be thinned down with pure clean soft water. Primer can be applied with brush or spray. Then after minimum four to six hours interval apply first coat of UGAMCOAT 07022007 with brush, roller or airless spray to the surface. Allow four hours for drying. Then apply second coat of UGAMCOAT 07022007 to the surface and again allow four to six hours for drying. Likewise go on applying the coats of UGAMCOAT 07022007 to the surface till you achieve dry film thickness of 700 microns for one-hour rating OR 1500 microns for two hours rating. Minimum five coats of UGAMCOAT 07022007 will be applied to wall for one-hour fire rating with interval of 6 hours. Minimum eight coats of UGAMCOAT 07022007 will be applied to wall for two-hour fire rating with interval of 6 hours. After application of final coat of UGAMCOAT 07022007 to the surface allow 24 hours curing. Then apply first coat of UGAM F R TOPCOAT WALL in desired colour shade over UGAMCOAT 07022007 for protecting fire retardant coating from weather. Allow it to cure for six hours and apply second coat of UGAM F R TOPCOAT WALL. This can be applied with roller, brush or spray. The surface will now be ready after 12 hours for regular use. This coating is warranted for five years or first incidence of fire from the date of application. In case surface is exposed to fire, the coating should be re-applied to the surface. The final dry film thickness will be around 900 microns for one-hour fire rating. Final dry film thickness will be around 1800 microns for two-hour rating. UGAMCOAT 141098 SB System is tested and certified for 2-hour rating by Government of India's National Test House Mumbai. We are specialized in manufacturing Fire retardant coatings. Product widely being used as fire retardant for buildings, furniture, electrical appliances, electrical lines and near flammable area to avoid fire hazards. We have separate coatings for walls, wood, cable and steel. For steel we have different coatings for interior atmosphere and exterior atmosphere. The fire ratings of the coating depend on the thickness of the coating and are directly proportional to the thickness. Fire rating means the surface will be protected for that much time. These ratings are 30 minutes, 60 minutes, and 120 minutes or half hour, one hour and two hours. The purpose is for getting the time till help arrives to protect property and lives. These coatings require fire rated primer followed by fire retardant intermediate coating and then finally the topcoat on the top. Primer is applied in single coat and is different for different surfaces. Intermediate coating thickness is different for different ratings and different surfaces. The topcoat requires two coats. The topcoat is necessary for protection of intermediate coat and for providing aesthetic value to the surface. We provide the test certificate for each batch we produce, and the tests are done as per ASTM test procedures. It releases water molecules once exposed to fire. It also forms charred layer to prevent the area from receiving oxygen and stopping the spread of flame. It also releases some gasses, which prevent the oxygen from reaching nearest surrounding. 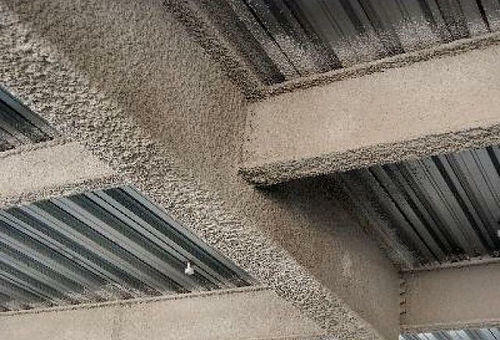 Finally when the temperature crosses 250 degrees Celsius, it forms foam and protects the structural steel from getting heat for conduction and convection. Due to the heat blockage, the steel does not melt and does not pass heat to other rooms. Hence due to lack of oxygen, presence of water and prevention of spread of flame, the fire does not spread and gets retarded. Prepare surface by shot blasting, hydro blasting, chemical cleaning or mechanical cleaning to accept primer. Then apply UGAM EP FIRE RETARDANT PRIMER to surface followed by UGAMCOAT 141098 after minimum interval of 8 hours. Repeat application of UGAMCOAT 141098 every 8 hours, till you achieve required film thickness for desired time rating. Minimum film thickness should be as specified above. After application of final coat of UGAMCOAT 141098, allow 24 hours to cure. Then apply two coats of UGAMCOAT 141098 having interval of 8 hours between coats. Once exposed to fire, the surface should be repainted. 1. Barclays Technology Center – Documents cupboards. 3. Goel Ganga Developers (I) Pvt. Ltd.
And many more emergency staircases and routes. 1) Vermiculite is a cementious base which has been formulated to provide passive fire protection to interior elements of building construction on a variety of backgrounds, including steel, concrete, polymer-based materials, timber and advanced composite to the cellulosic fire regime. 2) UGAM VERMICULITE is also suitable for thermal insulation of hot surfaces. 3) Vermiculite is used in building boards. These boards are often used as a 'core' in firedoors, to build fire barriers, to encase or construct ductwork and to protect steel building elements from the effects of fire. 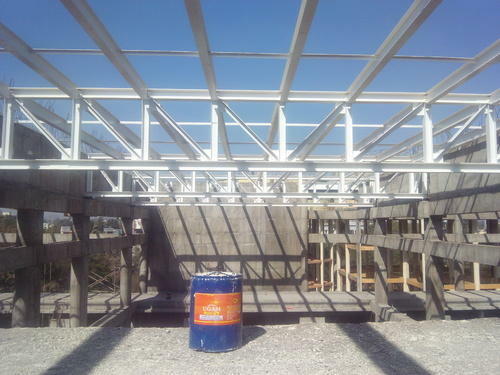 4) Vermiculite steel coating by means of vermiculite spray which is a tough, hard and highly stable passive fire protection coating applied to structural steel by spraying and trowelling. Looking for “Fireproof & Flameproof Materials”?